Phew! I've finally managed to get my Dish of the Month made, half way through the month. 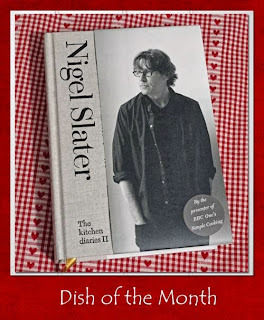 I had four Goosenargh duck legs from Farmison in the freezer so adapted Nigel Slater's recipe from The Kitchen Dairies, 30 October. The duck is marinated in brown sugar, vinegar, crushed juniper berries and sloe or damson gin. I didn't have any sloe or damson gin, but I did have some gin and some blackberry cordial that I had made the day before, so I added half and half gin and blackberry cordial. It seems to have worked well. As I had duck legs rather than breast, as in the original recipe, I decided to follow the technique used by Tom Kerridge in his TV series Proper Pub Food, this involved cooking the duck legs on a tray over a roasting tin (I used my grill pan) at 200C for 25 minutes, then you drain off the fat and reduce the heat to 120C and cook until tender (1 1/2 hrs for a whole duck, about 40 minutes for the legs). I only made a little change to the Duck Fat Potato recipe, using less fat, just what I gathered from the pan when roasting the duck legs, which I brushed over the potatoes and then baked in a dish in the oven. I also put the remaining marinade in a pan and reduced it to create some sauce for the duck legs. 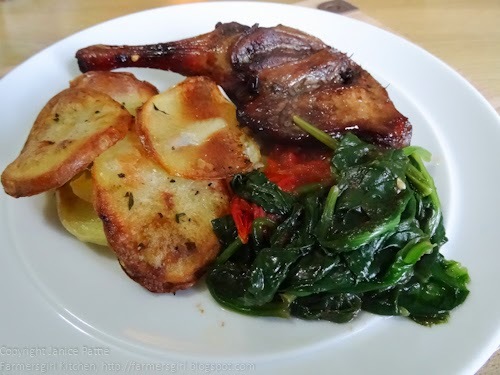 I served the duck and potatoes with spinach and tomatoes cooked together with...a little bit more duck fat. If you use twitter, tweet your post with @FarmersgirlCook or @Heavenona_plate and #DishoftheMonth and we will re-tweet it to our followers. 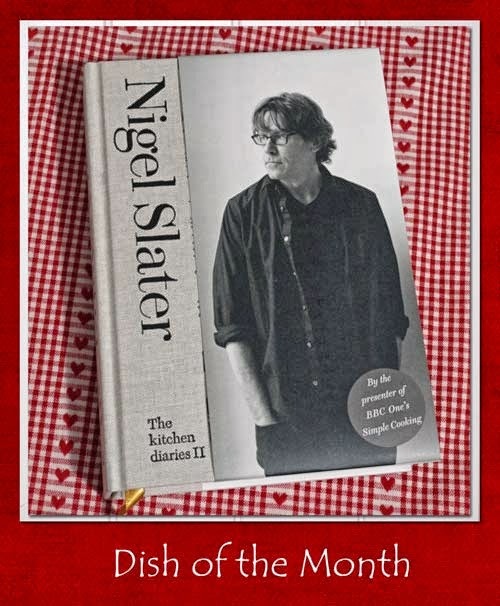 If you own The kitchen diaries II please do not publish the recipes on your blog without permission, they are copyright. If you are using recipes from the BBC Food website, please link to the recipe on BBC Food rather than publishing the recipe. Likewise recipes on the Guardian Lifestyle website. Recipes must be added to the linky by the 28th of each month. oh my god Janice, that plate of food is PURE heaven for me... duck and duck-fat potatoes... so mouth-wateringly divine... good old Nigel eh... now when do I get my invite for dinner? This sounds delicious Janice and look at those crunchy potatoes! I like your use of the cordial with the gin to compensate for the lack of damson gin. Is Food Blogging good for your health?